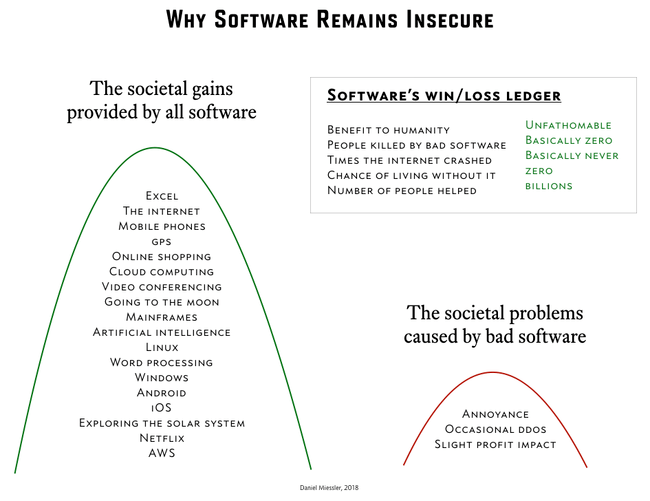 But there’s a far simpler and more powerful explanation, which is best demonstrated in a visualization like the one above: the existence of insecure software has so far helped society far more than it has harmed it. Basically, software remains vulnerable because the benefits created by insecure products far outweigh the downsides. Once that changes, software security will improve—but not a moment before. These failures are likely to start, by the way, largely due to the explosion of the Internet of Things. When we start having complete and long-lasting internet outages, companies being knocked offline for days or weeks and going out of business, and—most importantly—large numbers of people dying, then we’ll see a serious push for secure software. In the meantime, quickly developed, quickly deployed, and insecure code will continue to perform miracles for human civilization, and will therefore continue to be welcomed into businesses and society. In short, don’t expect change until we see the downsides of insecure software start to rival the benefits. And it’s currently not even close.